Bolting a house is not the same as a seismic retrofit. Foundation bolts in an earthquake retrofit are only one component in a three part system. Without the two other parts, plywood and shear transfer ties, the bolts are literally decorative. 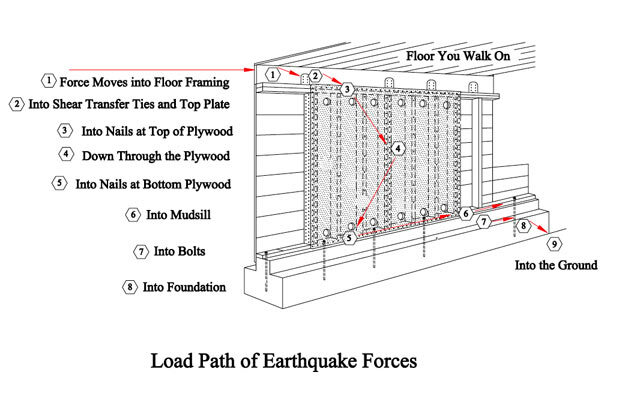 As you can see below, when the earthquake force pushes against the floor it can only make it into the bolts if it follows the “load path” provided by plywood, shear transfer ties, and bolts. All retrofit strategies are directed towards transferring the force into the bolts using plywood and Shear Transfer Ties, otherwise the house can be severely damaged. The size of the bolts does not matter. it is only the capacity that counts. A 1/2-inch bolt with a Mudsill Plate can resist 1340 pounds of earthquake force. What Do Foundation Bolts Do? Bolts are designed to keep the base cripple wall from sliding off the foundation. 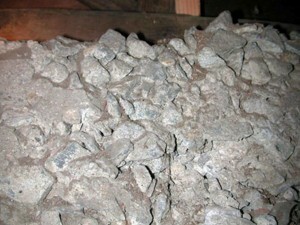 If the house does not have foundation bolts, the cripple wall may slide on the foundation. This in turn can break gas lines, cause significant damage to living areas, and pull out electrical wires. It is important to realize bolts without plywood and shear transfer ties, as illustrated in the drawing above. don’t do anything. The image to the left shows the lower portion of a cripple wall, which is also the base of a shear wall once the cripple wall has been converted into a shear wall. The red arrow represents earthquake forces pushing on the mudsill. If the mudsill moves on the foundation, the entire shear wall will move, taking the house with it. 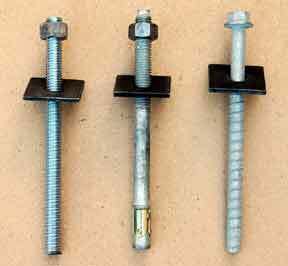 1-Bolt that is epoxied into Concrete 2-Wedge Anchor Bolt 3-Titen Bolt that screws into concrete. There are a few types of retrofit foundation bolts: epoxy bolts, wedge anchors, Titens, and Simpson Strong-Tie UFP IOs. These all are used to attach the base of the shear wall (the mudsill) to the foundation. All of them have been tested for their ability to resist earthquakes and are approved by all retrofit guidelines. It is critical that the bolts have been tested in independent research laboratories to make sure they will be effective in your retrofit. We use industrial bolts Manufactured by Hilti, a Liechtenstein-based company known for producing the highest quality bolts available. 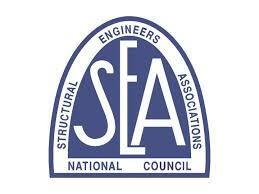 Tested bolt shear values are on page 8, International Code Council’s Evaluation Service Report 2302. 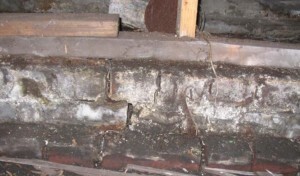 The bolt to wood connection is the part of the foundation bolting system that fails in earthquakes and should be strengthened whenever possible. 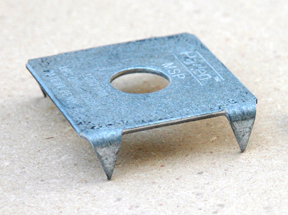 The bolt to wood connection can be increased 58% with Mudsill Plates, a product produced by a manufacturer in Los Angeles. Mudsill Plates were invented by Harlen Metal Products after the Northridge Earthquake to increase bolt strength and to reduce mudsill splitting caused by oversized holes, a phenomenon which is discussed below. Thousands of homes had split mudsills for two reasons: the bolts simply were not strong enough and secondly they were mis-installed with over-sized holes. It is important to use 3-inch square plate washers. Bolts have a slight tendency to bend and dig into the mudsill and cause it to split. Plate washers prevent this. These washers required in new construction should also be used in retrofit applications. The 1992 Structural Engineer’s Association tests showed that plate washers increased bolt capacity. Some people wonder if a bolt will work in an old foundation without rebar in it. Tests have shown that old foundations do just fine. A 1992 test report, “Foundation Anchorage Systems,” published by the Structural Engineer’s Association of Southern California, came to the following conclusion regarding old foundations without rebar. This test used bolting systems of all types including epoxy bolts, wedge anchor foundation bolts, and side plates. Side plates are a type of house bolting hardware suitable for homes with short or no cripple walls. When dealing with clearly deficient foundations like those shown here, the most effective method without replacing them can be found in a portion of this video on old foundations that discusses brick and marginal foundations. What if the Foundation Slides on the Ground? Most seismic retrofits are installed on older foundations with shallow footings (this means they are not very deep in the ground or sit on top of the ground), so it is important to understand their performance characteristics. Some people worry the foundation will slide on the ground. The answer is: So what? The house, ground, and foundation will all move together. The problem arises when the ground stops and inertia causes the house to keep moving off of the foundation. That is why re-enforcing steel (rebar), age, depth and size of the foundation are usually not a serious concern. What if the House is Already Bolted? Existing bolts can rarely be used because they almost always have over-sized bolt holes. This can weaken a bolt by 59% according to tests done after the 1994 Northridge earthquake.